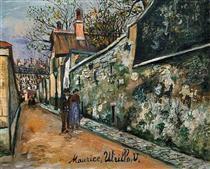 Maurice Utrillo (French: [mɔʁis ytʁijo]), born Maurice Valadon (26 December 1883 – 5 November 1955), was a French painter who specialized in cityscapes. 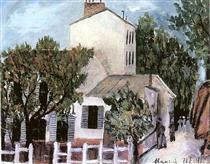 Born in the Montmartre quarter of Paris, France, Utrillo is one of the few famous painters of Montmartre who was born there. Utrillo was the son of the artist Suzanne Valadon (born Marie-Clémentine Valadon), who was then an eighteen-year-old artist's model. She never revealed who was the father of her child; speculation exists that he was the offspring from a liaison with an equally young amateur painter named Boissy, or with the well established painter, Pierre-Cécile Puvis de Chavannes, or even with Renoir. 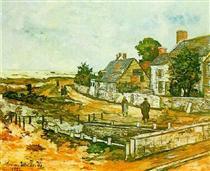 (see below under Utrillo's Paternity). 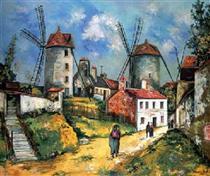 In 1891 a Spanish artist, Miguel Utrillo y Molins, signed a legal document acknowledging paternity, although the question remains as to whether he was in fact the child's father. Valadon, who became a model after a fall from a trapeze ended her chosen career as a circus acrobat, found that posing for Berthe Morisot, Pierre-Auguste Renoir, Henri de Toulouse-Lautrec, and others provided her with an opportunity to study their techniques; in some cases, she also became their mistress. She taught herself to paint, and when Toulouse-Lautrec introduced her to Edgar Degas, he became her mentor. Eventually she became a peer of the artists she had posed for. Meanwhile, her mother was left to raise the young Maurice, who soon showed a troubling inclination toward truancy and alcoholism. 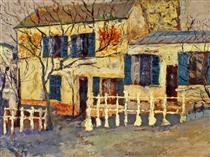 When a mental illness took hold of the 21-year-old Utrillo in 1904, his mother encouraged him to take up painting. He soon showed real artistic talent. 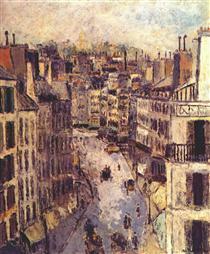 With no training beyond what his mother taught him, he drew and painted what he saw in Montmartre. After 1910 his work attracted critical attention, and by 1920 he was internationally acclaimed. In 1928, the French government awarded him the Cross of the Légion d'honneur. Throughout his life, however, he was interned in mental asylums repeatedly. Today, tourists to the area will find many of his paintings on post cards, one of which is his very popular 1936 painting entitled, Montmartre Street Corner or Lapin Agile. In middle age Utrillo became fervently religious and in 1935, at the age of fifty-two, he married Lucie Valore and moved to Le Vesinet, just outside Paris. By that time, he was too ill to work in the open air and painted landscapes viewed from windows, from post cards, and from memory. Although his life also was plagued by alcoholism, he lived into his seventies. 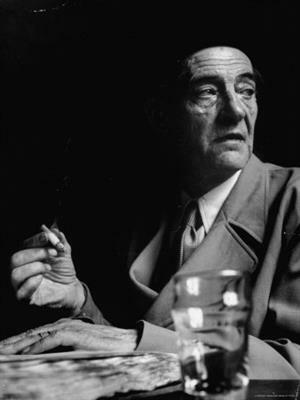 Maurice Utrillo died on 5 November 1955 in Hotel Splendid in Dax of a lung disease, and was buried in the Cimetière Saint-Vincent in Montmartre. 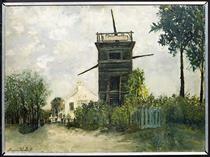 In 2010, several retrospective exhibitions were staged, at Oglethorpe University Museum of Art and in Montmartre (Paris) that culminated in an auction of 30 of Utrillo's works on 30 November 2010 from the collection of Paul Pétridès, Utrillo's art dealer, whose Galerie Pétridès also dealt with the likes of Jacques Thévenet. 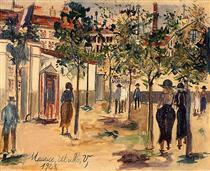 This follows the 2009 exhibition of Suzanne Valadon and Maurice Utrillo's works held in Paris in 2009. Distillery of Saint-Denis Maurice Utrillo ? 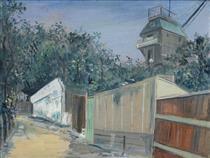 Land sale аt Gentilly Maurice Utrillo ? Mont St. Michel Maurice Utrillo ? Moulin de la Galette Maurice Utrillo ? 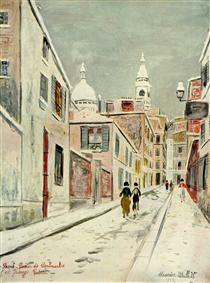 Rue Lepic Maurice Utrillo ? 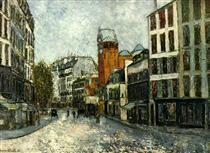 Sacre-Coeur and Passage Cottin Maurice Utrillo ? St. Vincent street Maurice Utrillo ? 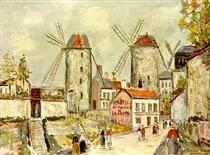 Windmills of Montmartre Maurice Utrillo ? 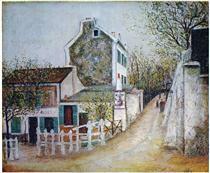 "Belle Gabrielle" Maurice Utrillo ? 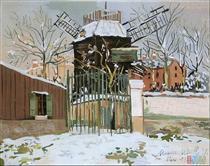 "Lapin Agile" Maurice Utrillo ? 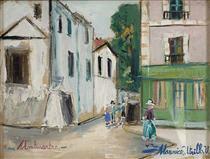 A Street in a Suburb of Paris Maurice Utrillo ? 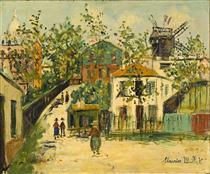 Abbesses street Maurice Utrillo ?